We want more. More peace. More excitement. More romance. More free time. More chocolate . . .
Our cravings are written into our DNA. They’re influenced by our childhood experiences. They’re driving the choices we make as adults. And often, they’re keeping us hungry. Never satisfied. Ever searching. What do they mean? What are we to do with them? Should we feel guilty? Are there solutions? 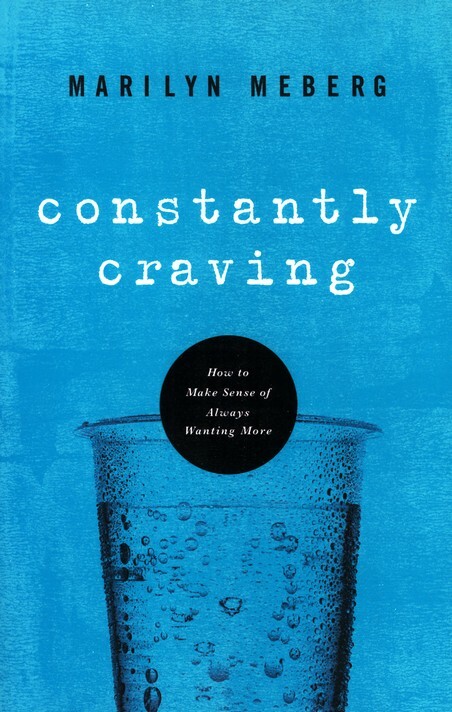 Counselor and author Marilyn Meberg knows all about cravings. She also knows the One who knit us together, desires and all. With wit and compassion, Marilyn helps us understand our appetites, offers advice for managing them here on earth, and encourages us to eagerly await the day when we will find total satisfaction in heaven. In the meantime, Constantly Craving is an excellent reminder that our desires for more can lead us to the One we really need, the only One who will quench our thirst forever. Really? Really! This book made me look into myself and understand myself better, and that's why I loved it. It is so true that we are constantly craving something, whether we know what that something is (something sweet to eat, a hug, a kiss, laughter, feeling safe, a new dres and so on) or we don't know what that something is. We just crave something. Now, this book, doesn't come out right and tell you, that something you need is God and He will fulfill you and you won't want for anything any more. I know that. You know that. The thing is, how do you get to the place where you are full and fulfilled? Knowledge isn't enough. It just isn't. It's how you live that matters. So this book began at the beginning. And the beginning is myself. It taught me things about myself that I didn't know, like where all this craving comes from. Its origin and what formed it so that I'll need this and not that. This was very helpful to me. Sometimes this book read a little too simplistically, and I had to roll my eyes. But these times were not too often, and I took so much from it that I can easily overlook these grandmotherly passages. I will recommend it to all my friends. And to you too. I received this book via Booksneeze.